China after the "Cultural Revolution"
The Independent photography Exhibition "Nature - Society - Man" in April 1979 in Beijing has obviously led to some debates in the Chinese leadership. Reports in two different documents speak of "reactions" and "differing opinions". 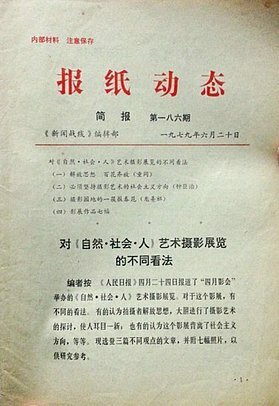 Of particular interest is a report (of which only the front page is available) in the publication "Developments in the Country in Straight Terms" (国内动态清样) by the Xinhua News Agency, classified as "top secret" and only available for highest officials of the Central Government then. 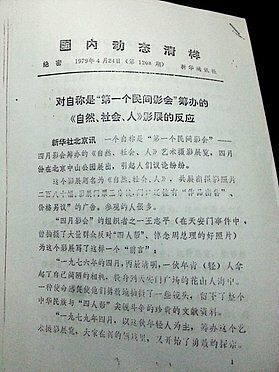 Der People's Daily report is quoted from the net archives ziliaoku.org. "Differing opinions on the artistic photography exhibition 'Nature - Society - Man'"; from the internal publication "Newspaper Trends" (报纸动态), briefing no. 186, 20.6.1979, p. 1; endorsement at the top: "Internal material - store carefully"
Own report. The "April Photography Association" has recently held an art photography exhibition "Nature-Society-Man" with their own photos in the capital's Sun Yatsen Park. It received positive reviews by the people who saw it. The 300 photos exposed, showed people's activities, natural landscapes, the growth of plants, animal habits and others. The photographers proved an open approach, and they couragously investigated through their photographic art. The topics of many photographs showed originality and unique composition. The main themes were chosen from real life, breaking free from old photographic stereotypes, an extraordinary breath of fresh air. The "April Photography Association" is a small group of young photography amateurs of Beijing, who organized it in their free time. It was in the 1976 April Fifth Movement, that they made their breakthrough, when they exposed themselves to danger, taking a large number of precious historical pictures. After the Gang of Four had been crushed, these youngsters continued their new ways, and the exhibits of "Nature-Society-Man" give a good taste of this. Although a small number of the displays might still show some artistic deficits, the efforts of the amateur artists to make the photographic arts in China flourish, still remain very valuable. This exhibition was helped and supported by comrades from the photography and arts scene.